Our Ultimate Bag Guides series is where we highlight all the need-to-know information (prices, size comparisons, colors and availability, among other salient details) of the high-end accessories market’s most sought-after bags, and today, we’re adding an absolute classic to that list: the Louis Vuitton Speedy Bag. First conceptualized in the early 1930s as Vuitton’s first bag intended for daily carry, the bag was based on another LV classic: the Keepall. The Speedy was first introduced in the 30 size (Louis Vuitton’s numerical size names refer to the width of the bag’s front panel in centimeters), and the smaller 25 was added in 1959 at the request of actress Audrey Hepburn. Fast forward to 2016 and the bag comes in four numerical sizes and a super-tiny version known as the Nano. To get price and size info, as well as photo comparisons and all the other details you could need to decide which Speedy you want, check out our guide below. Note: Not all sizes are available in all materials. Introducing the Louis Vuitton Speedy Amazon Bag. An updated version of the iconic Speedy Bag, the Speedy Amazon is a shoulder bag without the top handles. This bag is from the brand’s Spring/Summer 2016 Collection. The shoulder strap is adjustable, allowing the bag to be carried across the body. It has a double zip opening and opens to a sheepskin interior with two inside flat pockets. It also includes a leather nametag with a metallic Louis Vuitton logo. This new design features the latest Monogram Canvas colors for Spring/Summer 2016, which comes in Noir/Blue and Noir/Blanc. Available in two sizes, MM and PM. The Louis Vuitton Speedy Bag was first introduced around 80 years ago; it was designed while Georges Vuitton (the son of the founder) was still in charge of the company. But since then, nothing significant has been changed about the Louis Vuitton Speedy Bag. 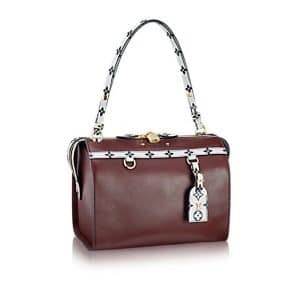 In all these years perhaps the biggest adjustments were mixing colors like the Speedy Totem Bag, changing the cover like the Monogram Empreinte or shrinking to size 20 or even smaller like the size Nano. But overall, the design remains the same. Today Nicolas Ghesquiere took the house’s most iconic bag to another level by introducing the Louis Vuitton Speedy Amazon Bag. The changes are immediately recognized but it’s truly cleverly injected. The new Monogram Canvas print (mixed with blue and black) is gently embossed on the handles, the side-strap, the luggage tag and a bit on the front. It’s like decorating the Speedy Bag with care so that the Monogram Canvas doesn’t shadow the true beauty of this bag. It’s not too much and not too little, the perfect balance. Crafted from Smooth Calfskin, the bag comes with an adjustable shoulder strap. The nametag features with metallic LV signature and there is even a LV Circle hot stamped signature on the back body. The 2 D-rings on the front allow for optional accessories or bag charms.